This was an renovated property and I was impressed with the style and design. The breakfast was of a great quality. Where to find Grand Rapids hotels near an airport? How can I find hotels in different Grand Rapids neighborhoods? Where can I find hotels in Grand Rapids that are near tourist attractions? If you are choosing where to base yourself while in Grand Rapids, you will find an extensive range of comfortable options. Expedia's up-to-the-minute database has 27 accommodation options that are within a 0.1-kilometre (0.06-mile) radius of the heart of Grand Rapids. Some of the more central lodgings of downtown Grand Rapids are the JW Marriott Hotel Grand Rapids and Courtyard by Marriott Downtown Grand Rapids. Grandville is a neighborhood that lies 10 kilometres (6 miles) from the heart of Grand Rapids and has 6 Expedia hotels. 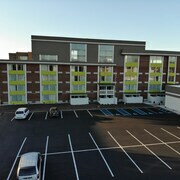 Hotels in Grandville are the Residence Inn By Marriott Grand Rapids West and Holiday Inn Express Grand Rapids SW. Alternative accommodation neighborhoods include Greenville and Walker. The Americinn Greenville and The Winter Inn are in Greenville, while Walker is where you'll find the SpringHill Suites by Marriott Grand Rapids North and Holiday Inn Express Hotel & Suites Grand Rapids-North. Wyoming is 8 kilometres (5 miles) from Grand Rapids' downtown, while Hudsonville is 20 kilometres (13 miles) from the heart of Grand Rapids. 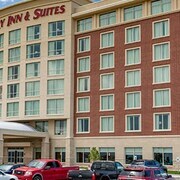 The Hampton Inn Grand Rapids South and Hyatt Place Grand Rapids-South are situated in Wyoming, while Quality Inn Hudsonville and Travelodge Hudsonville are located in Hudsonville. The Grand Rapids Art Museum and the Gerald R. Ford Museum also have some accommodation options nearby. The Amway Grand Plaza, Curio Collection by Hilton and the Holiday Inn Grand Rapids Downtown are near the Grand Rapids Art Museum and the The Leonard at Logan House and CityFlatsHotel Grand Rapids are close to the Gerald R. Ford Museum. If you have a budget to stick to and are hoping to find cheaper Grand Rapids hotels or apartments, you'll find that there are plenty of affordable places available in the area. The Best Western Executive Inn & Suites is 6 kilometres (4 miles) from the heart of Grand Rapids, while the Quality Inn Hudsonville is 20 kilometres (12 miles) away. 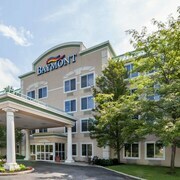 Different lower-cost hotels include the Hawthorn Suites by Wyndham Grand Rapids, MI and the Baymont Inn & Suites Grand Rapids North. 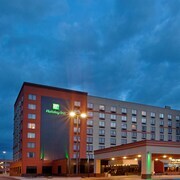 12 kilometres (7 miles) away from the heart of Grand Rapids, is the DoubleTree by Hilton Grand Rapids Airport. 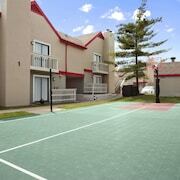 Alternatively, the Country Inn & Suites By Carlson, Grand Rapids East, MI can be found 7 kilometres (4 miles) away. Two other hotel and apartment options in this area include the Homewood Suites by Hilton Grand Rapids and the Hampton Inn Grand Rapids North. Once you have thoroughly explored Grand Rapids, why not travel a little more of the region? The Southwest Michigan district has a number of things to offer tourists. Admire Southwest Michigan's forests and lakes. You could also head to a selection of the region's art galleries. In this section of United States of America tourists can also try their hand at cycling, shore fishing and winery tours. Kalamazoo is 75 kilometres (47 miles) to the south of Grand Rapids and is home to the Western Michigan University and Kalamazoo College. If you'd like to visit Kalamazoo, be sure to check out the Radisson Plaza Hotel at Kalamazoo Center and Kara's Kottages. Or, you could stay in Heartside District, 0.6 kilometres (0.4 miles) to the south of Grand Rapids, where you can pick from the Riverfront Hotel, Grand Rapids and Hampton Inn & Suites Grand Rapids Downtown. Regardless of whether you're passing through or spending a few nights in Heartside District, set aside some time to visit the Urban Institute for Contemporary Arts and Spectrum Theatre. If you are flying into or out of Gerald R. Ford International Airport and are looking to stay nearby try SpringHill Suites Grand Rapids Airport Southeast or Holiday Inn Grand Rapids Airport. What are the most popular Grand Rapids hotels? Are there hotels in other cities near Grand Rapids? 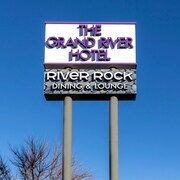 What other types of accommodations are available in Grand Rapids? Explore Grand Rapids with Expedia.ca’s Travel Guides to find the best flights, cars, holiday packages and more!